Hit the Prado Museum before the doors open to the public on this 4-hour Madrid tour — a Viator VIP available nowhere else. Only available through Viator, the exclusive experience offers access to the museum before its official opening time, meaning you’ll see works such as Velazquez’s ‘Las Meninas’ and El Greco’s ‘The Annunciation’ without the crowds. Learn about the artwork from a guide, and then head to the Reina Sofia to admire abstract and surrealist works by Picasso, Dali and more. If you want a private or small-group tour, upgrade when you book. With your guide, head inside the museum before it opens its main doors. You’ll be among the first to enter on this Viator VIP, so you can enjoy the art without the crowds that appear later in the day. Stroll around to see some of the best-known treasures and discover the history of the neoclassical building, commissioned by King Charles III in the late 18th century. Marvel at Picasso’s masterpiece of Guernica, and ogle works by surrealist Salvador Dali. Learn about each artist’s life and the abstractions they used to convey meaning. After around six hours in total, your tour ends. 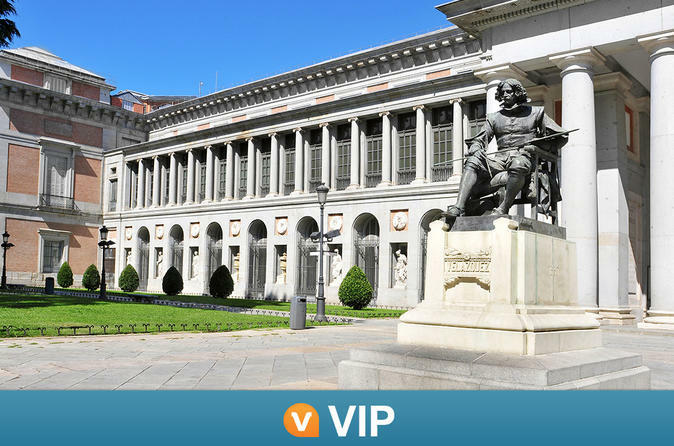 Explore the Prado Museum with a private guide, just for your sole group. Available for a maximum group size of eight people, the private tour offers a more personalised way to see the Prado, with commentary tailored to your interests. Enjoy the Prado Museum early access tour with a small group and guide. The maximum group size is 15 people, ensuring an intimate tour of this esteemed art museum.